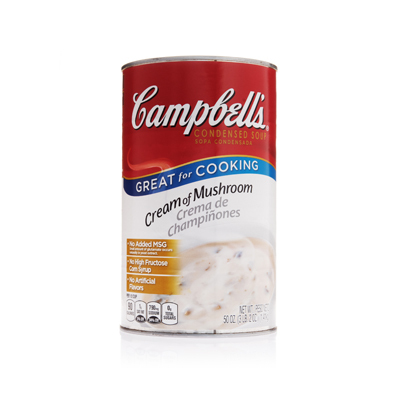 Add more flavor to Campbell's Cream of Mushroom with this casserole style crisp flavored with mushrooms, onions and Italian cheeses garnished with thyme leaves. 1. In large skillet heat oil over medium-high heat; add onions and sauté 3 minutes. 2. Add mushrooms and cook for 5-6 minutes, stirring often, until dry and golden. Remove from heat and reserve. egg, large, lightly beaten	 16 oz. 9 ea. 3. In large bowl whisk together Mushroom Soup, milk and eggs until smooth. 4. Stir in reserved mushrooms and shredded cheeses. CCP: Cover and refrigerate to 40° F. or below for later use. -Lay out 12 slices of toasted bread evenly in one layer to cover entire bottom of pan. -Pour 11 cups of mushroom mixture over top of bread slices and spread to cover evenly. Sprinkle top evenly with 1 cup of cheese. 6. Bake uncovered, in 350°F. convection oven 30-35 minutes until custard just solidifies and cheese is melted. Remove from heat and let set 15 minutes before serving. CCP: Hold at 140 ° F. or above for service. 7. To Serve: Cut each full steam table pan into 12 squares, top with fresh thyme and serve with ½ cup of mixed fruit. egg	 16 oz. 9 ea.